Universal beams are also known as parallel flange beams or wide flange beams. The cross section of a universal beam is either I or H shape. H shape beams are also referred as universal columns. The horizontal portion of the cross section of a universal beam is known as flanges, while the vertical element is termed as web. H beam has wider flanges than I beam. Universal beams are usually rolled from structural steels and are used in construction and civil engineering. The universal beam has the most efficient cross sectional profile since most of its material is located away from the neutral axis providing a high second moment of area, which in turn increases the stiffness, hence resistance to bending and deflection. H beams have equal or near-equal width and depth and are more suited to being oriented vertically to carry axial load such as columns in multi-storey construction, while I beams are significantly deeper than they are wide are more suited to carrying bending load such as beam elements in floors. When a beam bends the top of the beam is in compression and the bottom is in tension. These forces are greatest at the very top and very bottom. Since a universal beam has higher amount of material at the top and bottom sides and smaller material in the web, it provides a structural section which is stiff with use of least material. Though I-beams are excellent for unidirectional bending in a plane parallel to the web, they do not perform as well in bidirectional bending. These beams also show little resistance to twisting and undergo sectional warping under torsional loading. For torsion dominated problems, box sections and other types of stiff sections are used in preference to the I-beams. Increasing the depth of the beam increases the bending strength by the depth cubed, hence universal beams provide a lot of stiffness. However, the web thickness must not be small to avoid the buckling. The web of a universal beam resists shear forces, while its flanges resist most of the bending moment experienced by the beam. I- shaped beams are designed to carry high loads over long spans. They are a very efficient form for carrying both bending and shear loads in the plane of the web. The thick flanges and thinner web efficiently proportions material to resist the high bending loads from beam applications. However, I-shaped sections have a reduced capacity in the transverse direction, and are also inefficient in carrying torsion load. H beam is a high-performance section steel due to its advantage of optimized cross sectional area distribution and reasonable ratio of strength to weight. With the features of wide flange and thin web, H beam has large section modulus, high bending resistance and excellent mechanical properties. H beams are generally heavier than I beams and are useful as supports for retai­ning walls and the like. They can also be used as beam sections where headroom is of concern. Because of their outstanding properties, H beams are widely used for beams, columns and other architectural members, as well as in pile foundations, bridges and other civil engineering works. Universal beams differ from rolled steel joists which are also known as tapered flange beams. The flanges of universal beams are parallel and have constant thickness while those of joists are tapered and hence have varying thickness. Joists because of varying thickness flanges need tapered washers for connection. H beams have equal or near-equal width and depth, while I beams are significantly deeper than they are wide. Universal beams are produced from structural steels either by fabrication usually using steel plates or by rolling. Comparison of the cross sections of different types of beams is at Fig 1. Conventionally, the universal beams like other structural shapes are produced by rolling of steel blooms in universal stands (Fig 2). More recently, beam blanks with cross-sections in the shape of a dog-bone have been continuously cast, thereby bypassing certain stages in primary rolling. For I-beam production, the most recent process is continuous casting and rolling beam blanks with thin flange (e.g., with thickness less than 50 mm), to produce parallel flange beam with thin web. The conventional production process for rolling of the universal beam include heating of the bloom, rolling to proper contour and dimensions, cutting while hot to lengths that can be handled, cooling to atmospheric temperature, straightening, cutting to ordered lengths, inspecting, and shipping. The heating of the bloom for large sections is done in either of two types of furnaces, the pusher type furnace or continuous walking beam furnace. The pusher type furnace was used to serve nearly all of the older universal beam rolling mills, while recent trend is to use walking beam furnaces because of a large number of advantages. Normally universal beam mills are having one or two continuous walking beam furnaces. A typical mill for the production of universal beams has a two-high reversing breakdown stand in which the initial shaping is accomplished, followed by a group of three stands, arranged in train, where the rolling process is completed. H-beams were initially rolled on two high mills and three high mills and four roll universal type stands were used for finish rolling. However, the flanges were not as well drafted as the web and the beams were limited in size. Yet there was a considerable demand for beams of greater depth with thinner webs and larger flanges with little or no taper. This demand set the trend of the universal beam mills. 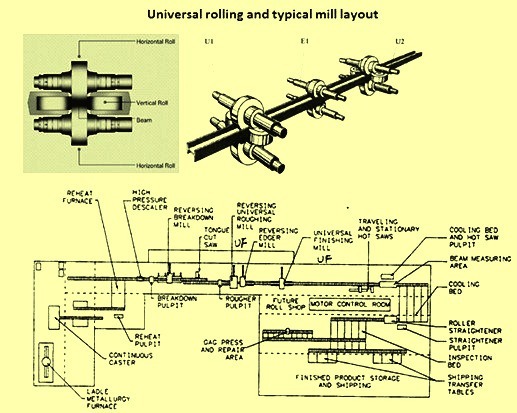 The composition of a normal universal beam mill to roll universal beams consists of a high pressure water descaler to remove scale from the heated blooms, a two high reversing break down rolling mill with multi groove rolls along with manipulators on both side of the rolling stand, a tongue saw to cut the head end of the material, a universal roughing mill, an edging mill, a single pass universal finishing stand, a hot saw, a gauge stop, two numbers cooling beds, a 7-9 rolls rotary straightener, inspection bed along with a gag press for the re-straightening of the beam if needed, a piling machine, a labeller, a cold saw, and a binding machine along with roller tables for movement of material in the rolling mill. The typical mill layout for such a rolling mill is at Fig 2. The universal roughing and edging mills are reversing multiple pass mills that run in tandem through computerized speed matching. The universal roughing mill is normally a four-roll mill with two driven horizontal rolls and two non-driven vertical rolls. The edging mill is usually a two-high, single groove mill stand. The universal finishing mill also has two driven horizontal rolls and two non-driven vertical rolls. After rolling, the universal beam undergoes finishing stages such as hot sawing for cutting the beam to cooling bed length. There are normally two saws consisting of one stationary saw and another travelling saw. Cooling bed usually has a combination of walking beams and transfer chains for movement of materials. In some mills water sprays are also used on the top and bottom surface of the cut beams for cooling before moving them to the finishing area. Modern universal beam mill is normally built with continuous universal stands to roll continuously cast slab or beam blank. The mill is normally fitted with automatic gauge control (AGC) system. The flange thickness for the cast beam blank is less than 50 mm. The slab or beam blank is usually heated with a continuous walking beam reheating furnace. Many reheating furnaces have four heating zones and a capacity of around 250 tons per hour. Modern reheating furnaces are fully computer controlled and can accept hot or cold slabs or beam blanks for charging. A complete mill train usually consists of one breakdown or roughing rolling stand, one universal stand group with universal stand U1, edger stand E1, universal stand U2 (Fig 2) and one universal finishing stand. There is a high pressure water descalar before roughing stand. Equipment also includes hot and cold sawing facilities, one roller straightener, inspection bed along with a gag press, finishing machines, roll turning and workshop equipment. All the equipments are connected with roller tables for the movement of rolling stock. In the finishing side there is chain transfer at some places. Modern universal beam mills normally have an annual capacity of 1 million tons or more. The roughing mill is often a reversing stand. Since thin slab or the beam blank with thin flange is casted and served as entry size, less passes are required than conventional rolling practice. The steel is rolled until its size fit for the universal stand of the beam mill. Typical beam mill universal stand group consists of a universal rougher stand with vertical and horizontal rolls, a horizontal edging stand and a universal finishing stand with horizontal and vertical rolls (Fig 2). To enables heavier slabs to be used as the starting material to improve yield, sufficient run out table length is usually provided. Normally the shaped rolling stock after the breakdown stand passes forwards and backwards through the mill, the universal rougher stand reduces the thickness of both the centre web and the two flanges while the edger rolls make contact with the flange tips only to control their length. The universal finishing stand remains open until the final pass when its four rolls impart a good surface finish to the section and ensure good dimensional tolerance. The height of the lower horizontal rolls on both universal stands can be adjusted as well as the upper rolls. This ensures that the web can be formed in the centre of the flanges. All the rolls in the three stands are positioned automatically by computer control programmed for the various sections’ shapes and gauges required. The mills are also equipped with the automatic hydraulic gauge control (AGC) system. This offers improved dimensional tolerance and high flexibility in the section sizes. Products such as H-beams, whose cross-sectional shape is not rectangular, can also be produced by rolling. Here, caliber rolling is conducted in the roughing stage. The materials are rolled by caliber rolls in order to obtain the same cross-sectional shape as that of the rolls. After producing a near H shape by caliber rolling, the product is finished by a universal mill and an edging mill. An H-shaped cross-section is formed when the material passes through four rolls, making the universal mill, which is equipped with a pair of vertical rolls and a pair of horizontal rolls, suitable for rolling H-beams. The edging mill is equipped with caliber rolls, and has the function of adjusting the flange widths of products. In the universal mill, variations of flange thickness and web thickness can be made easily by adjusting the roll gap. However, when products with different web heights and flange widths are to be rolled, it is necessary to employ exclusive-use rolls for these sizes, necessitating roll changes. In particular, since the web heights are determined by sum of the width of the horizontal rolls and flange thickness, it has to date been necessary to have the same number of horizontal roll sizes as product web heights. Development to overcome this problem has resulted in recent rolling mills and rolling techniques capable of adjusting the web heights by one roll with changeable width without changing rolls.